The Adverse Outcome Pathway (AOP) concept has been introduced to support risk assessment . An AOP comprises a number of biological events: a molecular initiating event (MIE) is followed by one or more key events (KEs), leading to the adverse outcome (AO). The AOPWiki  is a collaborative platform to exchange AOP-related knowledge. The use of AOPs for regulatory purposes requires detailed validation and linking to existing knowledge [3; 4]. Part of the development of AOPs is the search for data that supports the occurrence and biological plausibility of KEs and their relationships (KERs). This data can be found in literature and increasingly in databases. AOPlink case study developed within OpenRiskNet framework, focuses on establishing links between AOPs and data that supports a particular AOP. This will allow finding AOPs related to experimental data, and finding data related to a particular AOP. The case study involves the creation of links between AOPs and experimental data, chemical databases, and the molecular pathway database WikiPathways. In order to do that, a FAIR version of AOP-Wiki (the main AOP resource) and WikiPathways  are created, and by utilizing RDF, they are implemented in workflows. These workflows can be used, for example, to look up data for an AOP to support the biological plausibility, find AOPs related to experimental results, or identify the molecular pathways underlying the AOPs. 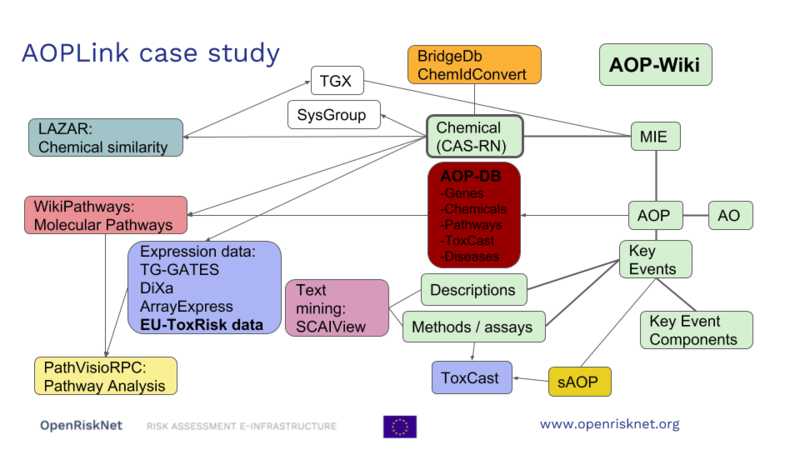 With respect to the other OpenRiskNet case studies, AOPLink can take input from SysGroup about similar chemicals (same group) in case no direct search results are found. Furthermore, TGX may provide predicted data to complement experimental data, to support searching and predict the MIE. Because AOPLink may result in hypotheses and list KERs, these results can be passed to ModelRX for further prediction and read across. To learn more on how AOPlink approach works, you are invited to join a webinar explaining the AOPLink case study, its progress and future directions on 26 March 2019. The webinar will also provide a brief introduction to the OpenRiskNet project and its case studies that are used to test and evaluate methods, workflows, and solutions for the predictive toxicology and risk assessment community. Please see more details on the webinar and register here. Additionally, a webinar organised jointly with US EPA on the Adverse Outcome Pathway Database (AOP-DB) will be held on 8 April. The details on this event here.